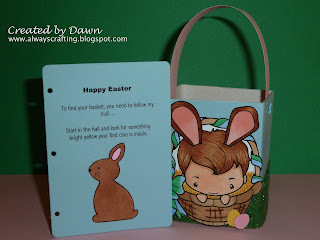 I was unsure what I was going to create for this challenge but then I got the idea for an Easter bag/basket. 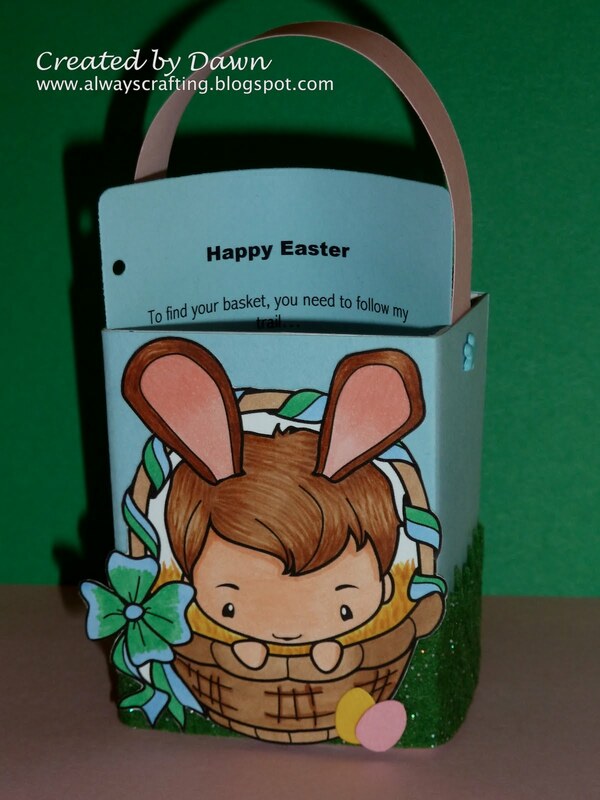 I wanted to make a small Easter basket to put bunny trail clues in for the kids. The bunny makes the kids find their hidden Easter baskets each year. He leaves clues around the house. :) The kids enjoy this so much. So this year I thought it would be fun for the bunny to put the first clue in these little baskets/bags. I used this box from a great burn lotion to make my Easter basket/bag. First, I cut the box in half and covered it with cardstock then added green felt grass. The grass was made with the Martha Stewart grass border punch. Love this punch. 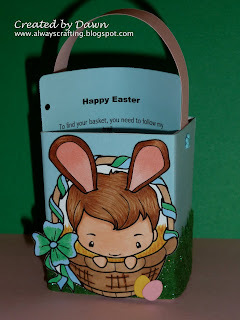 I used the "Easter basket Ian" digi from The Greeting Farm as my image on the bag along with some Easter egg die cuts from Quickutz. Then I used the new Lifestyle Crafts insert page die from the folder with insert die for the clue page. 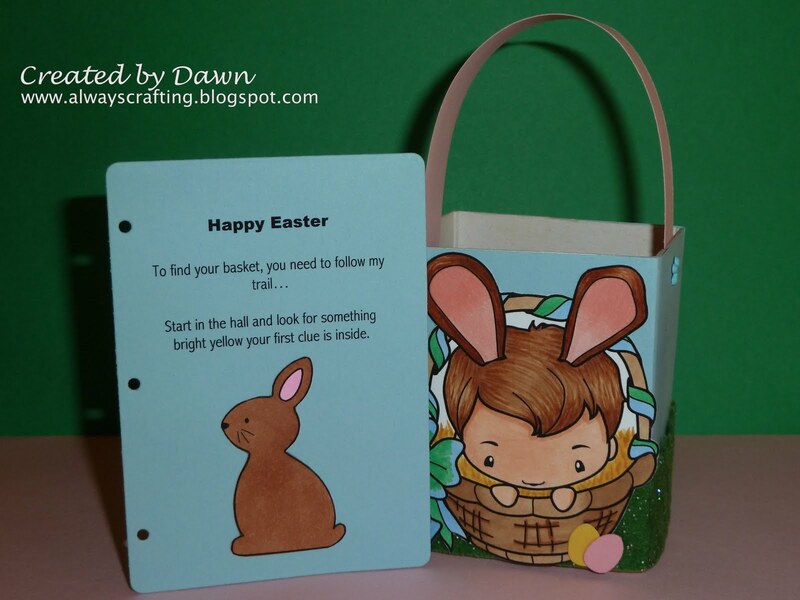 The bunny image on the page is from Whimsie Doodles. I used brads to hold the handle on and allow it to move back and forth. They turned out pretty cute don't you think? What special things do you make for Easter? OMGoodness Dawn! What a cute idea! And love the idea you recycled the box! Cool Idea! I can't wait for Grayson to be old enough to enjoy something like this. Bernadette, you are going to love it when he is old enough! Adorable "cute and sweet" project, love it when you can be green! Thank you so much for joining us at Freshly Brewed Challenges this week!!! Oh my goodness this is adorable! What a great idea. Fantastic idea - you've done a brilliant job, Dawn!! Thx for sharing with us at Ladybug Crafts Ink - hope to see you again! This is a great idea. Great for a class full of kids too. THanks for plying along with us at FOr Fun. OMG this is so creative. Great Job!! Thanks for playing with us at Going Grey with Scrap-Creations. 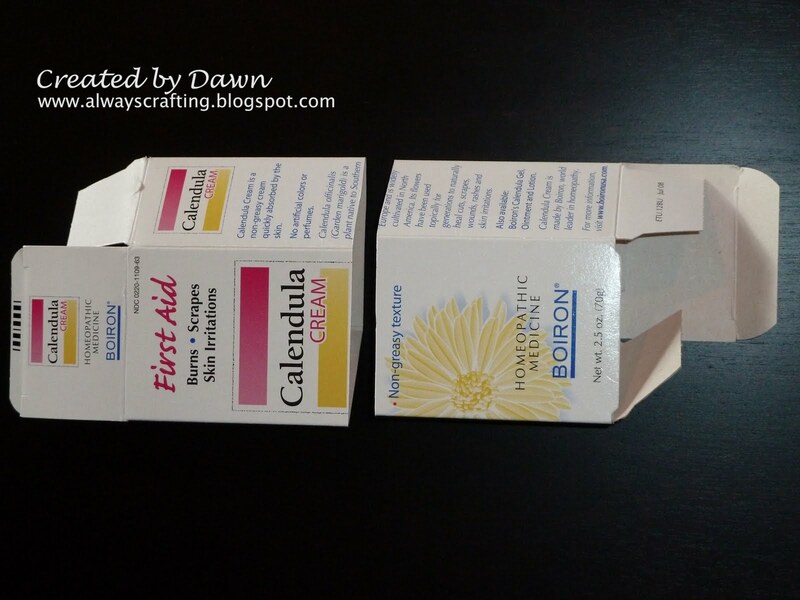 Wow Dawn, what a great way to recycle the box. I love the border punch that looks like grass and your image is adorable. Great job combining all of those challenges too. Thanks for making Catch the Bug one of them! Such a fabulous idea and what a great way to reuse something! Thanks for playing along with us at Paper Sundaes! That is so cute!!!! I love it! Thanks for joining us at Paper Sundaes this week! Wonderful project! Thanks for sharing it at Crazy 4 Challenges! Oh My osh, what a creative idea! Your project cae out wonderful. Good luck on all the cahllenges and thank you for joining us this week at Digital Tuesday challenge. I love your Easter basket! Super cute! Thank you for joining our “Celebrate Easter or Spring” challenge at Sentimental Sundays . Oh how cute! Thanks for playing in the Bugaboo Challenge. How creative! Thanks for playing at Catch-The-Bug this week! Great recycling Dawn and thank you for playing at the Aud Sentiments birthday blog hop. Oh how cute is THAT! So talented and creative - amazing! Thanks for joining us at LCI this week. Aww Dawn! How adorable is this? I love the little Ian basket, too too cute. Thank you for joining in on our Color theme at The Pink Elephant!